Are you interested in the future of your industry? Where your future customers may come from? What about your current career — or your next one? 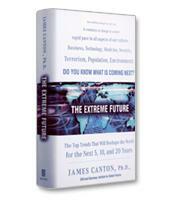 If so, The Extreme Future will offer the insights that may help you derive the answers. James Canton charts a course to steer you through the volatile changes that lie ahead. The Extreme Future is the essential guide for what's next and how to navigate the trends that will shape the future of business, markets and society. He challenges us that with the right information about future trends, it is possible to navigate the Extreme Future. How climate change and new energy demands will reshape the planet. How shifting population trends will transform the workforce. How radical innovation trends will create personal wealth and competitive advantage. How astounding medical advances will radically enhance people's lives. How dangerous terrorism trends will threaten the individual and society. How the rise of China will bring on a new global power struggle.